Need an efficient advertising signage solution that gets updated on a weekly or daily basis? Our swing open poster display cases for featuring ads and artwork in commercial settings come in many styles and sizes up to 48” high. Advertising wall signs feature metal or wood construction in a variety of finishes and styles to complement upscale or casual décor. This assortment of large print graphics enclosures holds everything from small notices to large-scale prints in portrait or landscape orientation. Our aluminum signage comes with straight, beveled, or radius top edges. We also offer a side-by side- advertising swingframes to give marketers more space for messaging. What are some of the stand-out features of these wall mounted sign frames? 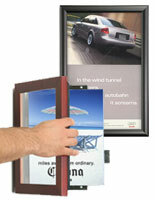 Our swing open poster display cases come in an array of sizes from large (up to 36” x 48”) to small. 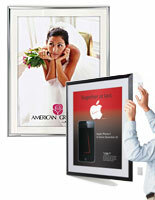 Mount advertisements, display artwork and photographs, or showcase an important announcement. Movie posters or oversized prints placed on the outside of a building will need to be larger in scale for visibility. 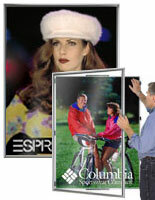 Some large poster models are sold with removable black or white mats that enable size adjustments. These swingframe enclosures feature a unique front-loading hinged panel and patented gravity latch system that enables easy graphic updates without having to remove the system from the wall. The door will not swing open when you don't want it to. Want to change up some messaging? Just lift the metal lever that is positioned discreetly behind the framing so customers can’t find it, then release it to close the latch shut. Some units come with a plunge lock and two keys for optimal security. 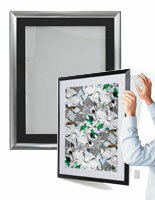 These large-scale picture holders come with an acrylic lens to protect displayed artwork from dust and sunlight. When you’re showcasing artwork or graphics that would be hard to replace, these locking sign holders are the perfect solution. Some of them also have a black or white mat that gives the customer more than one sizing option. Our selection includes models that are rated for indoor-only or outdoor-only use, plus illuminated indoor models. 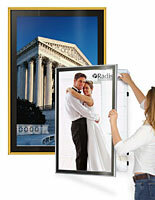 Some of our frames feature two mounting areas side by side but most are for single graphics. 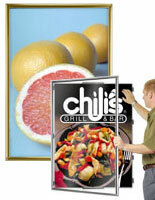 Our outdoor-rated advertising displays have a rugged impact resistant polycarbonate lens to keep out the elements. These durable and popular rust-resistant poster enclosures are wall mounted on the outside of a professional office building, corporate park, or retail store. Our outdoor-rated sign holders feature a patented 3-sided rubber gasket design with heavy duty weather stripping that ensures keeps treasured artwork from exposure to the elements by creating a moisture barrier. 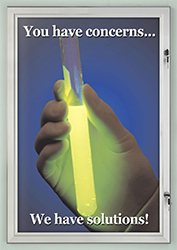 Metal swing open poster display cases are made of anodized aluminum to stand up to the flurry of activities in high traffic areas like school corridors and hotel lobbies. This art print framing comes in economy and deluxe styles, with black, silver, or gold finish that blends with any décor. 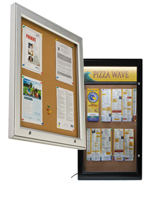 Advertise classes, products, and events with metal wall framing for large posters, medium enclosures for announcements, and small signs for reminders and notices. Libraries depend on swingframe signs for notices pertaining to adult education courses, new exhibits, and movie rentals. In addition to metal signage we offer wood poster holders for upscale retail environments and professional settings. Mahogany and cherry finishes make a dazzling display for decorative artwork or advertising posters in any of these settings. Like our metal signage, these wood sign displays come in a variety of sizes with flat or beveled profiles. While they are sold at an affordable price, our featured frames look luxurious hanging from a wall in an upscale setting and will add to the décor, while showcasing your graphics in style. Where are wall mounted advertising swingframes typically used? Bars and restaurants rely on lighted signage to advertise live music or comedy acts, menu and drink specials, hours of operation, and more. Our poster lightboxes are popular with eating and drinking establishments because they have use for them at night. Retail showrooms, boutiques, and salons use swing-open frames for advertising new products, logos and branded content, or just creating the right store vibe for the brand using interesting artwork. Since merchandisers have a lot of seasonal changes, sales, specials, and factory blow-outs, they are always changing up their messaging - so swing-open signage really works well for shops and boutiques. Movie cinemas rely on large-scale poster holders to promote featured films. These large sign frames are usually scattered all over a cinema so visitors can view the titles as they wait in line for tickets, popcorn, and entry into their selected movie. Place frontloading aluminum frames in visible spots so moviegoers will see the upcoming attractions. with quick-open design up with new releases. Our swingframe signs are great showcases for poster notices in breakrooms, hallways, and cafeterias in hospitals and schools as well as professional offices and banks, travel and real estate agencies, airports and train stations. Each of these poster holders is shipped with screws and anchors, reusable sticky tabs, polystyrene clips, or polycarbonate hinges for attachment to a wall or building — the type of hardware depends on the style of the unit. These locking cases slide into a a pre-attached metal bracket (included) for a snug, secure fit. 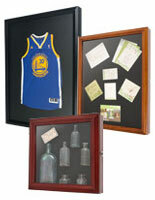 Each of our marketing display cases has a built-in wood, foam board, or duraplast backer for stability. Most of these sign frames are easily installed by one person - no need to hire a professional. These locking cases slide into a a pre-attached metal bracket (included) for a snug, secure fit. When ordering, be sure to check product specs for sizing, mat selection (if applicable), frame profile, and other details that will be key to selecting a perfect display.